Equipe Mestre Wilson Australia very first student (also Minol's brother-in-law) Anker came for a visit last week. Anker moved to Brisbane a while ago and kept training under professor Eduardo from Garra Jiu-Jitsu and also received his Black Belt recently. It's good to see that he kept training and achieved this level . Well done and thanks for the visit! Esther finally came to train at Evolve MMA! She arrived on the 15th December and had a busy schedule. On Friday night she helped Minol in the class, correcting the others. 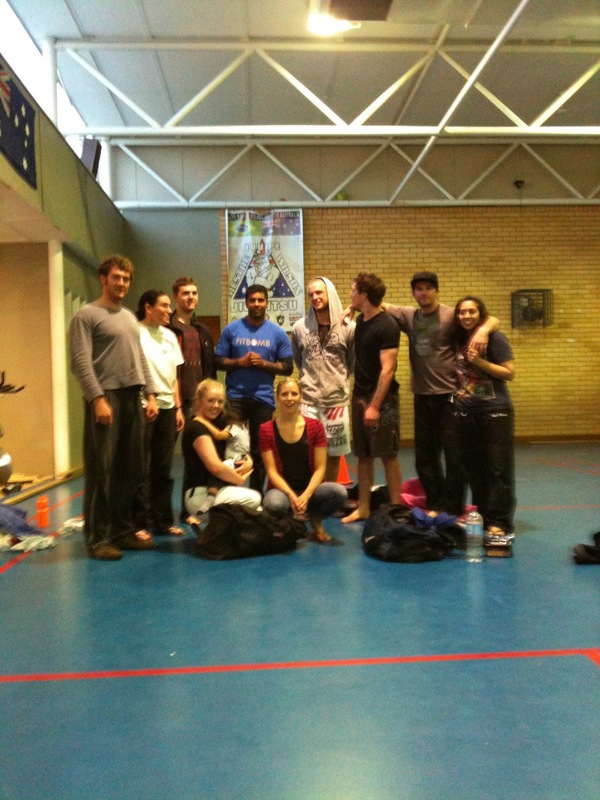 training Judo after the Jiu-Jitsu class with some of the best coach in Australia. Check out this video we made in Melbourne, I used this a lot in Brazil. for their new ranking, and to Chris for his first stripe. Last Saturday was exam day at EMWJJA, the new blue belts did a pretty good job. Also Paul got his instructor bars on his black belt, well deserved! Our blue belt Ian haven't been to training for almost 6 weeks, where was he?? He was travelling to Tanzania and took this photo with the club patch at the highest point in Africa! Now who's going to climb Mt. Everest and take a photo with the club patch? 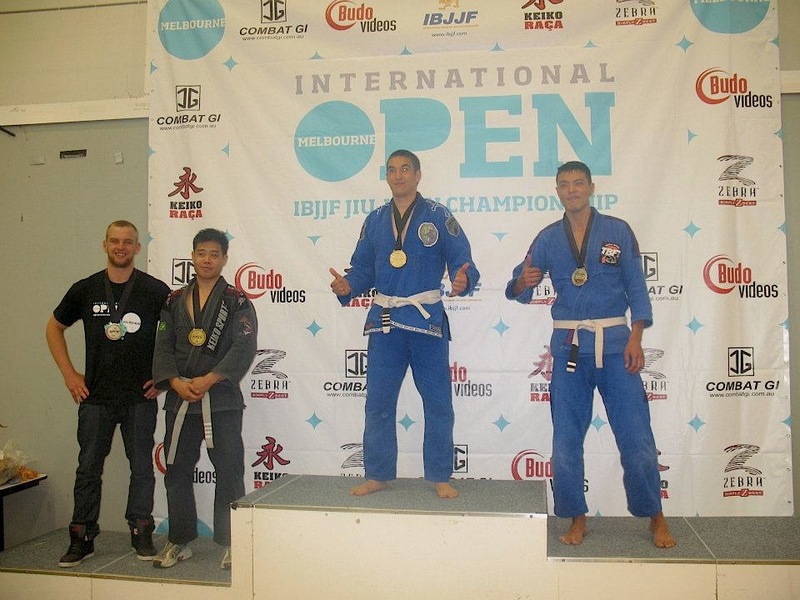 Melbourne IBJJF International Open where we had some good results. Anthony got a bronze and Mareo got a bronze on adults. 6 competitors and 9 medals! 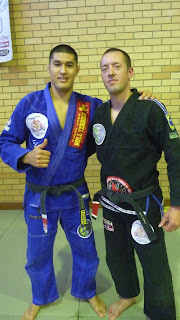 Our blue belt Edwin moved to Melbourne and he had his last training with farewell on the 19/12/2011. Edwin will be training at Evolve MMA with Minol. Good luck on you new journey! The guys who went to compete in the Melbourne IBJJF International Open went to visit the new home of Minol, Esther and Edwin at Evolve MMA. It was a great pre-competition training and good to see the students making new friends. Born on the 14th of April of 1951, in the city of Rio de Janeiro, resident in the neighbourhood of Padre Miguel. 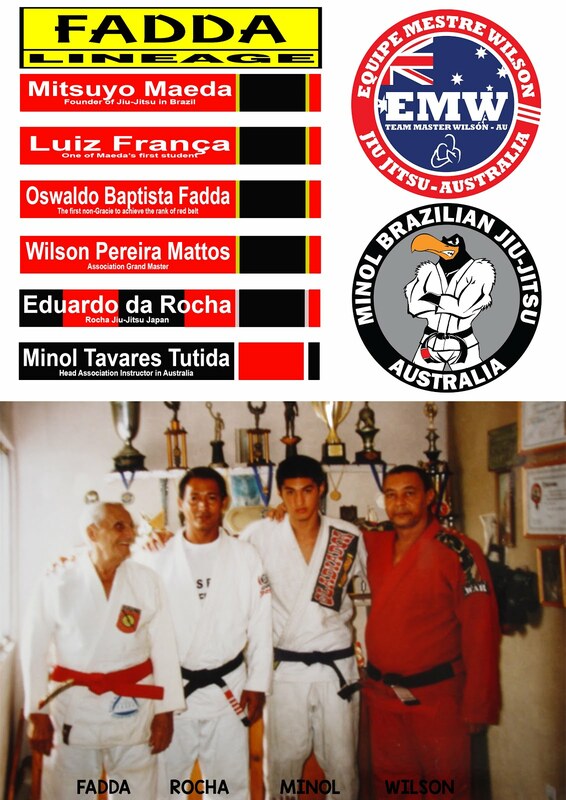 Master Wilson, a practitioner of Brazilian Jiu-Jitsu began his journey on the 22nd of April 1956, at 5 years of age. Since the beginning and from then on, always training under Grand Master Fadda. Wilson was considered a student of a lot of energy with a strong temper, difficult to be tamed in the gym where he had many fights and was suspended many times. Wilson says that he deserved every suspension but Fadda always made him come back, driven by Gregory (the owner of the gym). Wilson and today is considered a great example in the community of jiu-jitsu and he says that: “everything I have is because of jiu-jitsu”. In the old days many academies promoted their students according to the performance of fights within the academy. The Fadda academy was no different. 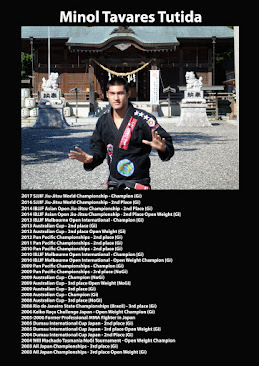 Wilson recalls that he needed to beat 10 brown belts to receive his black belt, "Everything was very difficult for me, I won competitions but it wasn't enough." 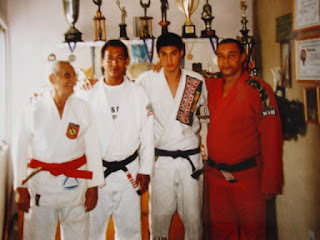 In 1970, at 18 year-old he receives his black belt from Grand Master Oswaldo Fadda. Wilson says that Fadda never believed that he would be able to achieve such a feat and that motivated him even more to continue training. So after the black belt came another challenge that was to be a great teacher. Wilson says that in the same year he began teaching classes in the student club in Realengo, where he formed a team of students who defeated Fadda's own students at an inter-club competition. This now proved that there were no more challenges for Wilson and he received much praise from Fadda. In 1995 Wilson receives the red and black belt granted by CBJJ. During a trip to Sao Paulo for a competition, the ceremony took place at the Bonsai Academy, coordinated by Professor Adilson Souza. On this day Wilson makes an oath to himself: "No student of mine should go through what I have to be promoted, but I require dedication-yes, and the problem should never be financial. I'll never look down to the belt, I will always look up because the belt for me is to keep the gi closed, nothing else. ". Wilson always say:" if you have love for jiu-jitsu that will be eternal and when we love, we do not betray. If the problem is the money, I'm betraying. If I'm betraying I wrap my kimono and throw it on top of the wardrobe. I'll always be that way in my path, love jiu-jitsu. Try to make those who pass by my hand as disciples because today is very hard to hear this word, Disciples! 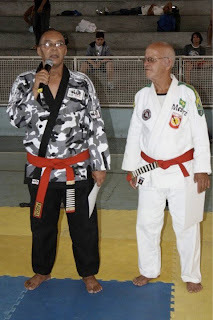 In 2009 the Confederation of Brazilian Jiu-Jitsu Sports (CBJJE) come to recognize his 9th degree and Wilson receives from the hands of President Moiseis Murad his red belt and the title of Grand Master. Congratulations Master Wilson. 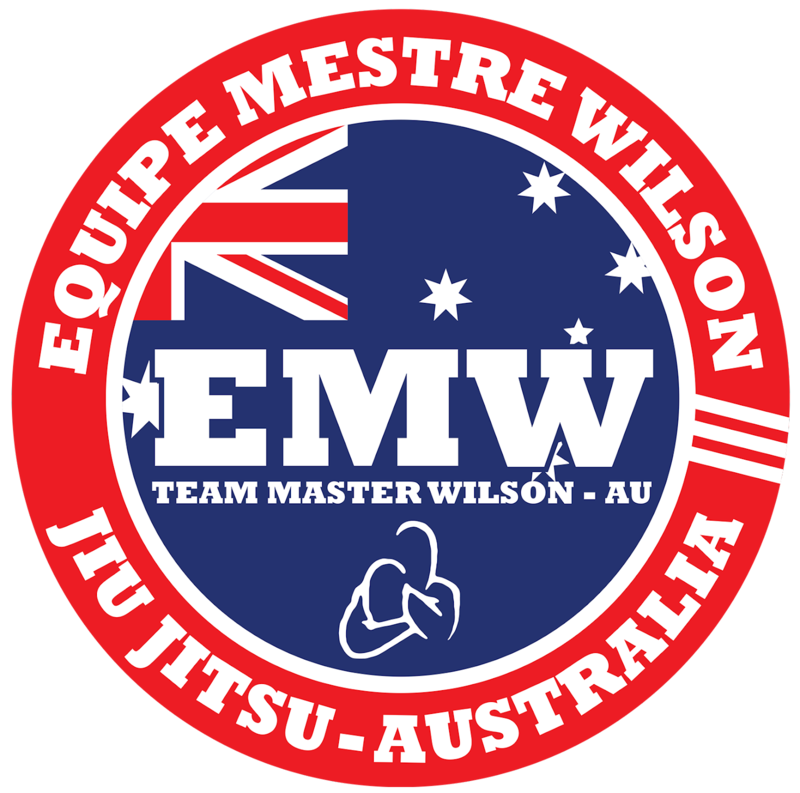 This page of Equipe Mestre Wilson Jiu-Jitsu is dedicated to students, friends, fighters and family members who know our master “Wilson Mattos”. 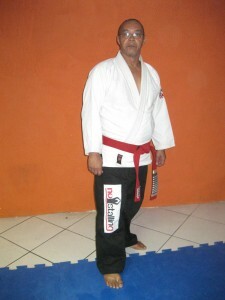 Better known as “Shihan”, our master, still teaching classes, devoting his entire life to our sport Brazilian jiu-jitsu. Our club is recognised nationally and internationally in many federations and with academies in the United States, Australia, Portugal and Japan. Oswaldo Fadda was born in Bento Ribeiro a City in the State of Rio de Janeiro on the 15th of January 1921. Fadda started training in 1937 after he joined the Brazilian Marines. 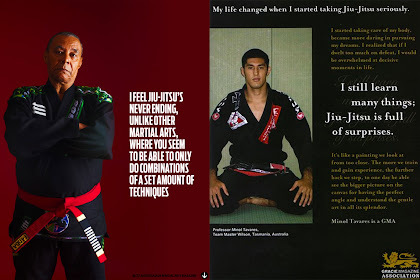 His training began with Luis França one of Mitsuyo Maeda’s students that earned his belt at the same time Carlos Gracie was taught Jiu Jitsu. 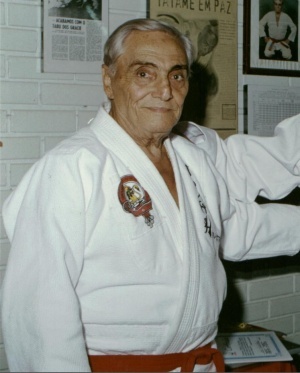 Oswaldo Fadda received his Black Belt from the hands of his instructor (França) in 1942 and soon started giving Jiu Jitsu classes in his home town on the outskirts of Rio de Janeiro. Always trying to promote the BJJ way of life through discipline and honour, he would often do demonstrations in public squares, beaches, favelas (slums), ouside churches and even circuses and church patios. On the 27th of January 1950 Oswaldo was abble to finally open his very own academy fully dedicated to Jiu Jitsu, but he was always seen as an outcast by the Gracie’s who failed to see the potential of a BJJ team in the suburbs. In 1951 Fadda issued a challenge to the Gracie Academy. He issued the contest through the Media stating in the Globo journal: “We wish to challenge the Gracies, we respect them like the formidable adversaries they are but we do not fear them. We have 20 pupils ready for the dispute.” Helio gracie accepted to have his students face Fadda’s. The event took place in the Gracie Academy and Fadda’s team won, making better use of their footlock knowledge, something the Gracie’s lacked and frowned uppon ever since, calling it “suburban technique” (Tecnica de Suburbano). The highlight of the competition was when Fadda’s pupil “José Guimarães” choked Gracie’s “Leonidas” to sleep. The event had good media coverage, which had a double effect. While the victories gave Oswaldo’s team notoriety (and more students) it also brought the interest of all the hardman of the nearby cities who would often come over to the academy to issue challenges to Fadda and his students. The occurence gained such proportions that Fadda decided to make a weekly event in which all challengers could compete against his students in a closed door environment. For many years, these fights took place and it is said that never did Jiu Jitsu lose a fight. Oswaldo Fadda spent the rest of his days in his hometown of Bento Ribeiro, like the humble man he was, with his students and his family. With age he started suffering from Alzheimer’s desease struggling with the illness for years. He finally succumbed to bacterial pneumonia in 1st April 2005, he was 84 years old. 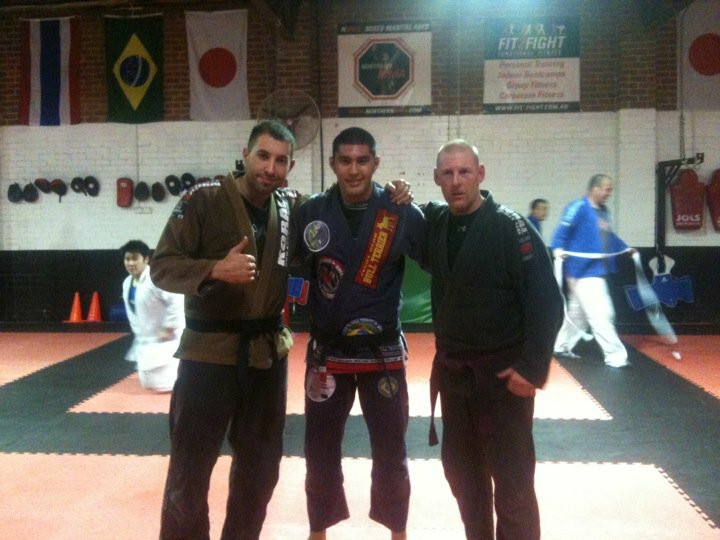 From the 29 August - 01 September Minol was in Melbourne taking classes at Evolve MMA. Let's hear what Minol has to say about his trip. "The guys there where great! Really dedicated to training, showed respect and loyalty. It really felt like home. Evolve MMA has become another part of the E.M.W.J.J.A family. It was great to spend some time with Phil (who started on a new adventure on the mainland). I'm looking forward to conduct classes there from next year, but will miss you guys in Tassie... I'm sure Paul will do a great job when I'm gone, and I will come back whenever I can to keep you guys updated. Thank you all Evolve MMA guys for having me, will see you guys at the end of September. 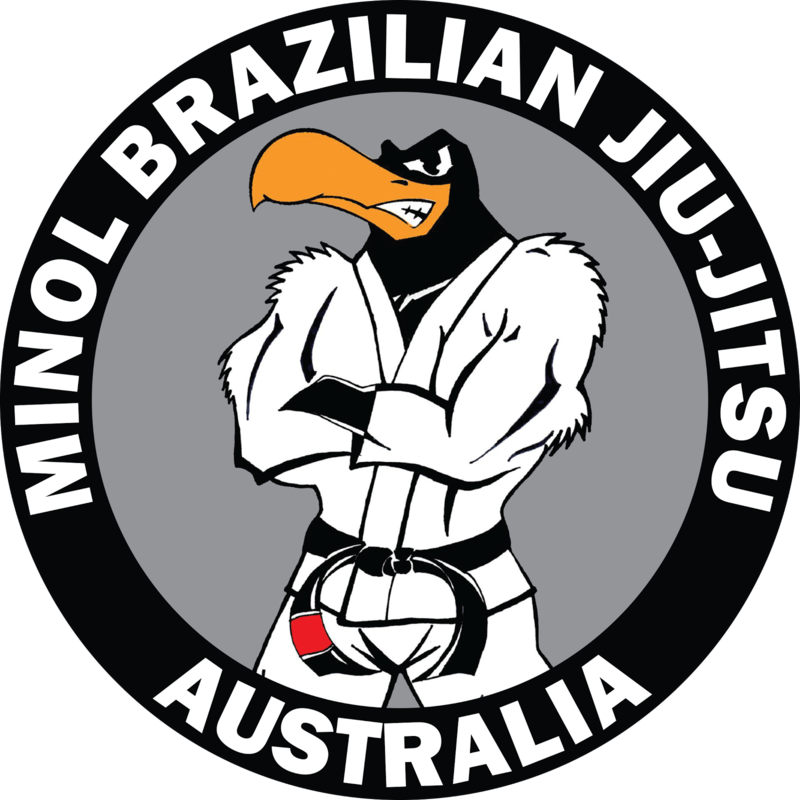 As our instructor Minol and his family will be moving to Melbourne early next year to take classes at Evolve MMA the classes at Kingborough Sports Centre have finished now, thanks to all Equipe Mestre Wilson Jiu-Jitsu Australia members for the support. 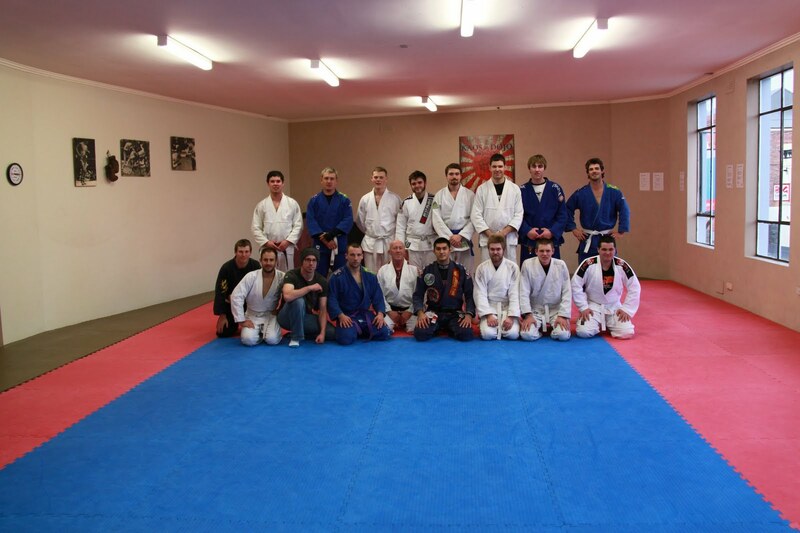 On the 30/07/2011 Minol went up north to do a seminar at Kaos Dojo. 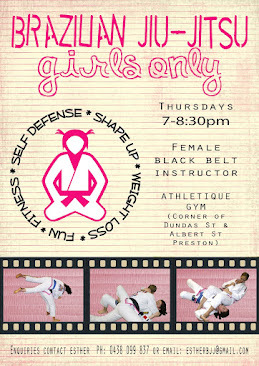 Kaos Dojo is run by Peter de Been's purple belt Trevor Baker. "It was a great day teaching those guys and hopefully they enjoyed as well"
Thanks for receiving me Kaos Dojo. Great article too. Well done! 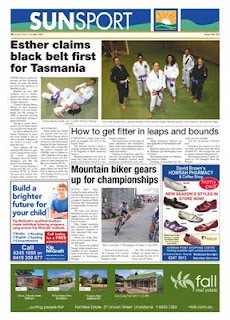 Congratulations to Esther for her well deserved black belt, she is the first female black belt in Tasmania and could be the only female black belt in Australia. We contacted the president of AFBJJ and he says there are no other females registered as black belt and he doesn't know any other female black belts in Australia. 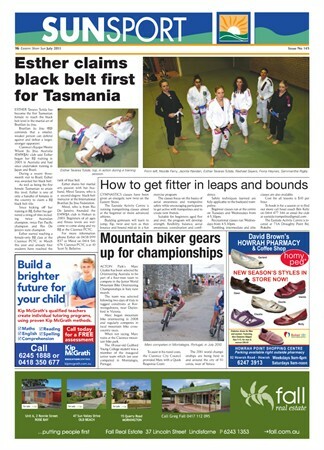 But the big thing is that Esther is Grand Master Wilson's first female black belt as well! Esther started training in 2003 and since then she didn't stop, not even when she was pregnant! Here is a funny story about her. 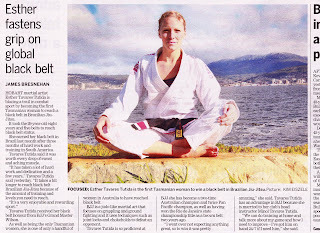 At the 2008 Australian Championship she was breastfeeding little Minol when they called her name to fight, she handed the baby to a friend to hold and rushed to the mats, then the fight was over and she went back to her Mum stuff, now thats dedication. This is the article from The Mercury news paper. Congratulations Esther! Now you have the hard work to pass on your students the same dedication, discipline and loyalty. 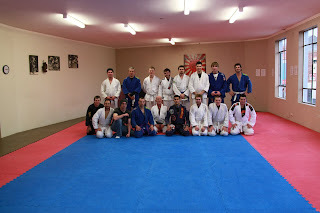 The AFBJJ-TAS CHAMPIONSHIP was held at the Launceston University on the 25th of June. It's good to see people from the mainland to come and participate as well. Our club did pretty well and it was a good warm up for the Pan Pacific in September. 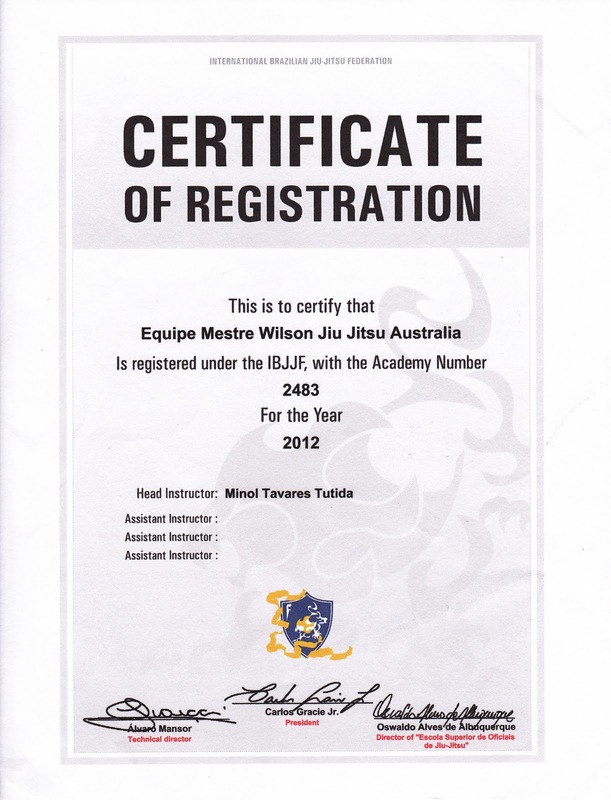 Well done to all the Equipe Mestre Wilson Jiu-Jitsu Australia. Australian Elite Team academy in Melbourne. The seminar went really well with great people involved. 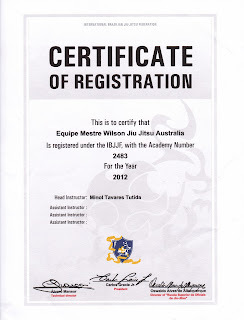 Big thanks to the Australian Jiu Jitsu Alliance guys (AJJA)! we've learnt 3 years worth of techniques! I thank this man for being my Master, father and friend. Teaching me just some of the many techniques he knows, but with no secrets and open heart. He is an example of humility!